Aston Villa's faint hopes of securing Champions League football were dealt another blow as Diego Tristan grabbed a late equaliser for Gianfranco Zola's side. Villa had looked on course for their first win in 11 games when fit-again Emile Heskey broke the deadlock early in the first period. 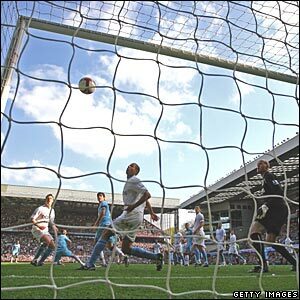 But Tristan levelled matters with six minutes remaining when he headed in a shot from Kieron Dyer which was going wide. It means Villa are still seven points adrift of fourth-placed Arsenal - who are on FA Cup duty this weekend - and have now played a game more. They have taken just three points from the last eight league games and are without a home win since early January. Villa played with great fluency with stand-in skipper Gareth Barry instrumental in setting up wave after wave of attacks. His midfield partner Stiliyan Petrov and winger James Milner also made telling contributions while Heskey and John Carew always demanded close attention up front. But West Ham played their part in an end-to-end game with Mark Noble a key figure and Villa needed goalkeeper Brad Friedel to make a trio of fine saves before Tristan's late strike. The Hammers opened brightly and Friedel prevented them taking the lead after two minutes. Noble threaded a pass into the path of Junior Stanislas and his darting run took him through the heart of the Villa defence but Friedel managed to deflect his shot just past the post. Villa threatened seriously for the first time when Barry was only just wide with a glancing header from a Nicky Shorey centre. And in the 11th minute Heskey put Villa ahead. Barry broke down the left before picking out the run of Milner on the opposite flank, and his low centre was turned home at close range by the England striker. West Ham quickly responded and Friedel again did well to block an effort from David Di Michele before James Tomkins fired the rebound over the bar. Green had to be alert to keep out a low drive from a narrow angle by Milner who then had a goal-bound drive blocked by Herita Ilunga. Noble became the first player to be booked in the 20th minute for a challenge on Barry. The game was full of goal-mouth action and Ashley Young's 20-yard drive clipped the outside of a post after his initial free-kick had been blocked by the defensive wall. Heskey almost struck for the second time when he intercepted a back pass from Noble and clipped his shot at full stretch against the post. Boa Morte was booked for ungentlemanly conduct after appearing to go down too easily when challenged by Barry on the edge of the Villa box. Then Ashley Young was yellow carded after eye-balling Lucas Neill who had brought down the Villa winger. Villa started the second half on the offensive and came close to doubling their lead within the first two minutes. Carew showed good skill before flicking his pass through to Heskey whose low shot was blocked by an alert Green. Luke Young had to be alert to take the ball away from the feet of Di Michele after he found half a yard of space inside the Villa box. Carew was not far off target with a near-post volley after good play by Luke Young to create the opening. But he should have doubled Villa's lead when heading over from Ashley Young's inswinging centre. Friedel protected Villa's lead by pulling off a fine save to deny Boa Morte at close range. But with six minutes left Tristan headed in a shot from Dyer which had been going wide. Aston Villa Friedel, Luke Young, Davies, Cuellar, Shorey, Milner (Gardner 81), Petrov, Barry, Ashley Young, Heskey (Delfouneso 71), Carew. Subs Not Used: Guzan, Sidwell, Knight, Salifou, Reo-Coker. West Ham Green, Tomkins, Upson, Collins (Dyer 33), Ilunga, Neill, Boa Morte, Stanislas (Nsereko 74), Noble, Di Michele (Sears 81), Tristan. Subs Not Used: Lastuvka, Lopez, Payne, Hines. Booked: Noble, Boa Morte, Upson.